I can’t believe it’s been 10 days since my last post! I’ve been very busy lately with both my new job and yarn4socks so haven’t had much time for any kind of crafting or posting. I have been staying on top of all my blog reading at least… I apologize to those who’ve commented lately and that haven’t gotten an answer yet, I’ll do my best to reply at some point. This week is going to be crazy as we got tons of new stuff going into the store and I’ve got to put it all up by Sunday’s update. So you might not see me around much this week either! I’m hoping that next week things will settle down a bit and I’ll be able to resume an semi-normal crafting/posting schedule. 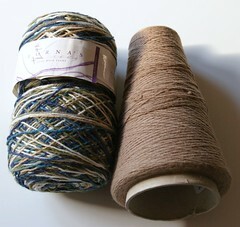 The point of the swap was to knit a pair of socks for your pal and ship them out by May 1st. The person knitting for me was Becky of Leggy Creations. Due to a series of event, Becky contacted me and told me that she wouldn’t be able to make the May 1st deadline but that she would send me a package as soon as she could. Thus, this Friday, I was surprised to receive a big box from my mail man. And this is what was in it. It was a great package to receive and I really appreciate everything Becky sent me. Thank you Becky! Yay! Aren’t her blockers great? And I just love the coasters! Wow, that was certainly a package worth the wait! Those coasters are gorgeous. 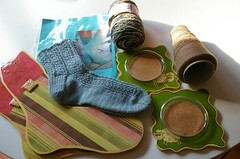 I love the sock blockers and the sheep coasters are so cute. I’m so glad you loved the contents of the box. You deserved it all for the time you had to wait. Happy Knitting. 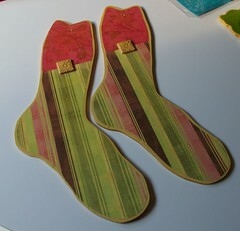 I know Em will be happy to know you love the socks too.